Today is Father’s Day, a day that celebrates fatherhood and all the things that dads do. My father is the breadwinner of our household. He provides us with everything. He is like my best friend. He is the family’s disciplinarian, fueled by beer and the smell of morning paper. These responses cannot be disregarded because they are true for many families around the world. When we talk about the traditional family, we inevitably encounter the traditional father as well – the family figure made of testosterone who works at least eight hours a day and comes home exhausted to kiss a wife and eat extra servings of rice with the rest of the family afterwards. No matter how we see it, the father is expected to do certain roles vis-a-vis his wife, children, and other relatives as well. 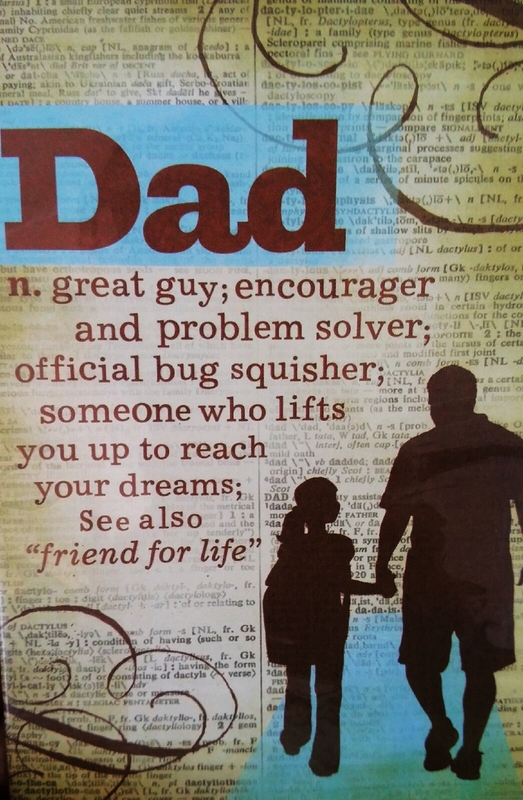 And what better way to examine how these gender roles and expectations are expressed than in Father’s Day cards? Three “chairs” for a father. 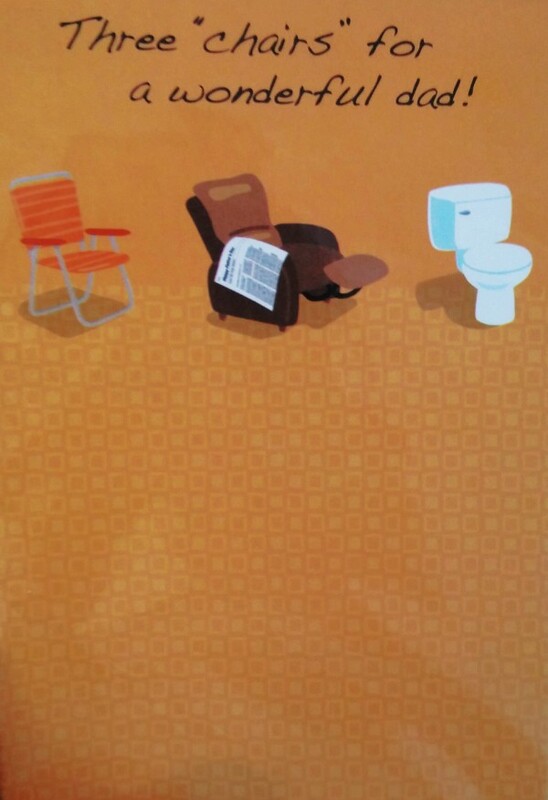 According to this card, the father occupies particular spaces inside the house. He occupies the living room and the garden, which implies the need for a well-deserved rest after a long day at work. He also spends extra time in the toilet, which tells us of his consumption patterns and how they differ, given his position as the “head of the house”. 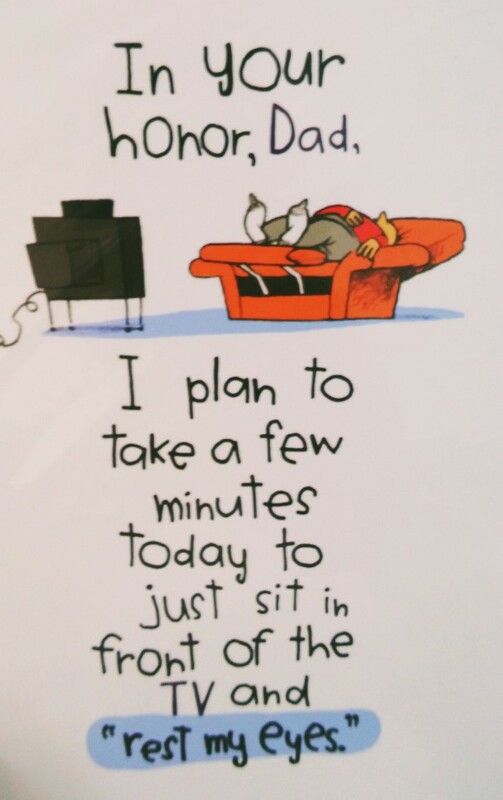 Here, we also see how fathers are expected to sit in front of the television after work or during the weekend, rather than perform household chores such as cooking for lunch or cleaning the house. In these cards, we don’t see a father being assigned to the kitchen or the dining room because a mother is expected to satisfy her roles within those particular domestic spaces. Daddy doing the vehicle work. 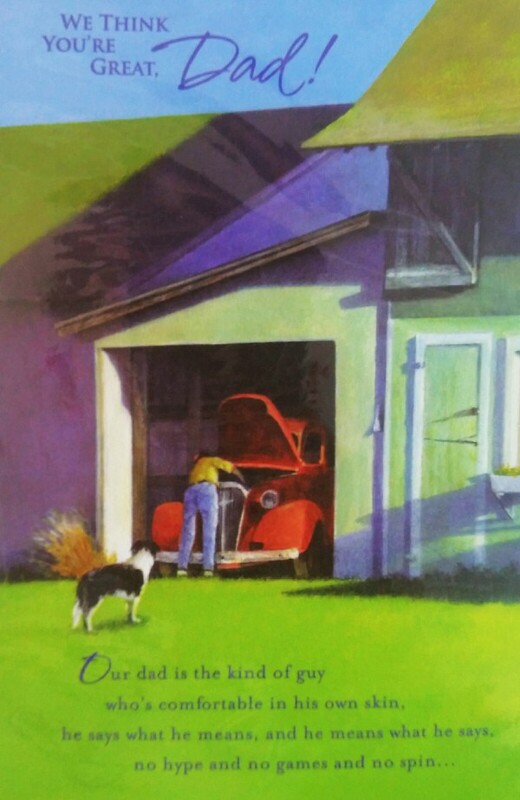 Next, we see a father fixing a vehicle. In traditional terms, acting as the family mechanic is a masculine endeavor – something that requires greater physical strength and an interest in big toys that go vroom vroom. The father is, after all, expected to be the one behind the wheel when the family is together. Daddy, a friend for life. Sharing a brew with father. 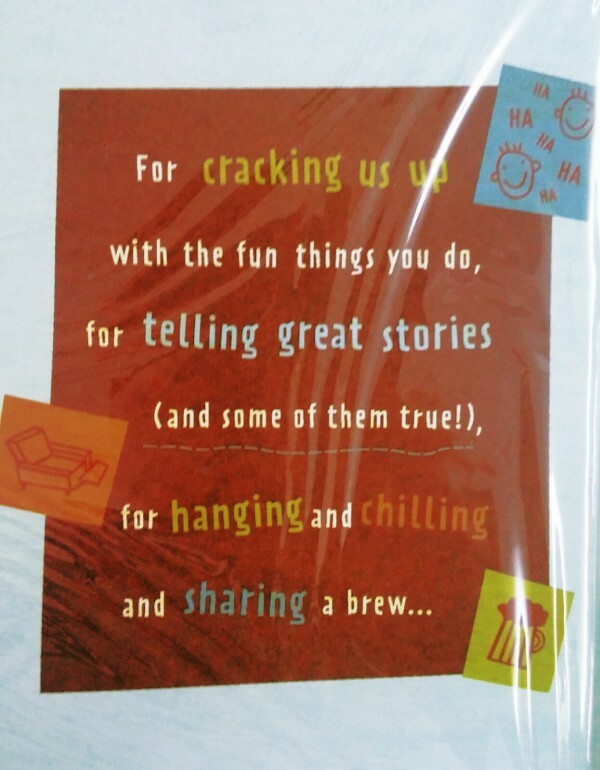 Lastly, these cards show how a father is seen as a friend for life, a problem-solver, a good man to his wife and an even better one to his children. It’s interesting to note how these cards do not necessarily speak of the father as giving care and affection. As expected, this role is usually asigned to the mother, the one who brings the feminine touch and the soft side to the family. These are just some of the ways of looking at how fathers are expected by society to fulfill their traditional roles. Of course, there are many out there who break norms and become good fathers without taking conventional identities and responsibilities. We have single fathers, gay fathers, estranged fathers, and fathers who stay in the house and do domestic work. With these in mind, I leave you with a few questions to think about: In what other ways is fatherhood expressed in your own household? How does this conform to, or go against, traditional gender norms? How can Father’s Day recognize the multifaceted realities of fatherhood?